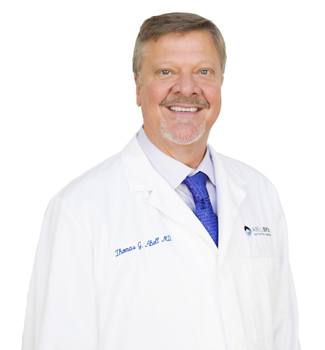 Dr. Tom Abell, M.D. was the first surgeon to perform LASIK eye surgery in Lexington, KY. He performed his first surgery in 1985 and continues to be a leader in the field. Dr. Abell has been one of only a few surgeons in the U.S. to be selected to be part of Alcon’s Refractive Clinical Advisory Board. Dr. Abell has offices in Lexington and Campbellsville Kentucky and offers the latest diagnostic and treatment technologies available. A pioneer in refractive surgery, Dr. Abell, is a board-certified ophthalmologist who has performed over 35,000 refractive procedures since 1985. He is an active member of the American Board of Ophthalmology, a member of the American Society of Cataract and Refractive Surgeons, and certified by the American College of Eye Surgeons. Dr. Abell graduated from the University of Kentucky, and the University of Kentucky College of Medicine. Following an internship at Jewish Hospital (Cincinnati), he served as chief resident in the Department of Ophthalmology at the University of Kentucky Medical Center. In the mid-1980s, Dr. Abell became one of the leading innovators in lens implant surgery and refractive surgery. From that period to the present, Dr. Abell helped train ophthalmologists in the U.S. and abroad in advancing techniques of intraocular lens implants surgery and refractive surgery. As a result of his accomplishments, he was one of the core investigators in the Food and Drug Administration American Laser In-situ Keratomileusis (LASIK) study (CRS/USA). Dr. Abell also served as a clinical core investigator for the Allegretto Wave Laser, which received FDA approval for both nearsightedness and farsightedness in 2003. Dr. Abell has conducted numerous courses and presentations on refractive surgery (ALK, PRK, RK, LASIK, et al). He has been a frequent speaker at the American Society of Refractive and Cataract Surgery, International Society of Refractive Surgeons, and many ophthalmologic associations in the U.S. and throughout the world. In addition, he has authored many published and peer-reviewed articles about refractive surgical techniques. Aside from all of Dr. Abell’s dedication to the field of ophthalmology, he also supports many charitable organizations throughout the region.